"Ive got a lovely bunch of coconuts! There stands me wife. The Love of Me Life. Singing- Roll a bowl a ball a penny a pitch!" 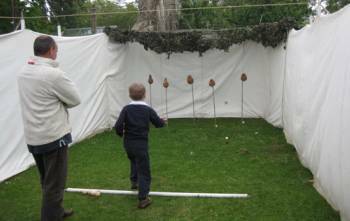 You can't get a more authentic booth at a fete or fair than a traditional coconut shy and it makes a great fundraiser. 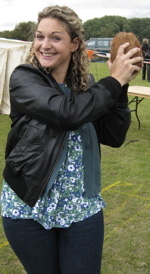 For years people have enjoyed pitching wooden balls at coconuts; knocking a nut of its stand to win it as a prize. Everyone just loves this fairground classic. 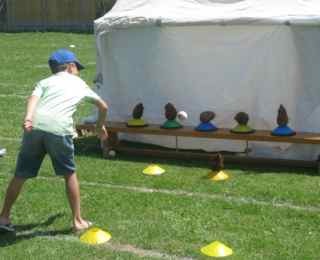 But you don't have to be a traveling showman to run a coconut shy. The basic set up is quite straightforward and as an attraction at your event its a great money maker. Wooden balls - Wood is best but there is no reason not to use small hard plastic balls. It is important that the ball will not bounce back after hitting a nut. You need something a bit smaller than a baseball. If you have the time wooden balls can be made by rounding off small wooden blocks with a rasp. Stands for the coconuts - Traditionally these were posts about 3 foot high with a wooden cup shape carved on the top to hold the nut. Stands can also be made from iron bars with a round loop at the top. Your stands should be reasonably robust otherwise they may topple when struck by a ball and you only really want the coconuts to be a target. For quick fixes you can easily make your own using traffic road cones with sink plungers stuck in the top. This sounds a bit primitive but actually works really well (you may wish to weight the cones down). Another cheap option is to cut in half an old tennis ball. Turn the halves inside out and nail to the top of broomstick dowel.Paint your stands nicely (this is showbusiness after all). Red and white stripes are traditional. A rope or other barrier - Stretch this along the front of your shy to keep people at the right distance. And to avoid accidents. You may wish to have a smaller, closer set up at the side for children. 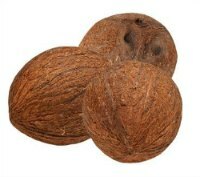 Coconuts - Buy these by the sack from a local fruit and veg wholesaler. You will find their numbers in your local phone directories. Set up your shy somewhere where there is plenty of room. Be careful to site it sensibly -just in case! Here is a rig up intended for younger children. 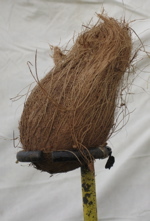 The coconuts are simply resting on the bases of school sports posts. That's it. All you need now is a "Barker"- the traditional name for the showman who would try to call the punters over to his stall. "Roll up! Roll Up! Try your luck! Who wants one of these lovely coconuts!" If you want to put together your own Coconut Shy most of the bits and pieces are available on Amazon. Click the link to your store.